A couple of weeks ago I finally got around to actually upgrading to Leopard on my laptop. One of the things I was interested in trying out once I got upgraded was Apple Mail’s new Note feature. Okay, so it’s become clear to me at this point that Googling the problem is just not going to work. I decide to fire up Console to see if there are any enlightening error codes. 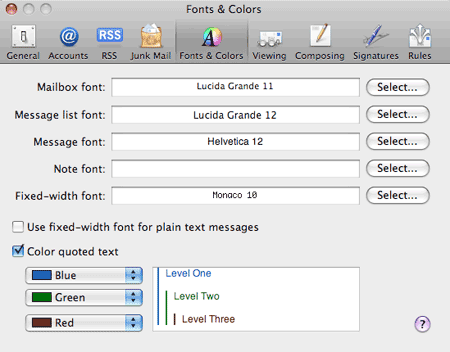 Console does at least offer me something, in the form of “Mail font-family cannot be nil”. The field for the Note font is completely blank. I selected a font and attempted to open a new note. Success! As it turned out, this happened to be a very simple solution for a very silly problem. That solution took me over an hour to figure out. Unfortunately, I’ve never been able to figure out why that field was blank in the first place. I wonder how many other people have had this exact same problem and just given up on trying to figure it out.